Tuesday October 8th (Day 1 of the show) Having attended every Medtrade since its inception, I was always impressed by the high quality of the speakers and the attitude of vendors who were introducing new opportunities. But to truly appreciate Medtrade, nothing can show it better that the enthusiasm of the attendees. Dealers and providers came to Orlando to get a better understanding what is happening in DC with CMS and Medicare. They are aware there will be a continuing number of independent dealers “falling out” which will leave the beneficiaries and family caregivers (their customers) to shift for themselves. The vendors all understood this problem and the speakers addressed them. AA Homecare and the state associations all are geared up to maintain the DME/HME industry as a solid profession. I know how often I have stated there are far too many companies whose livelihood is at stake. These dealers and providers must give AA Homecare and their state association the support the need by joining with all the other dues paying members! The vendors brought the attendees new products and new means of marketing and I am back to WOW. The great number of opportunities for OTC cash sales that could be found on the floor was phenomenal. There was something for everyone! By the time the showroom closed I realized there will be some superb changes in direction for many companies and they will harvest a bountiful crop. I look forward and see you again next year! 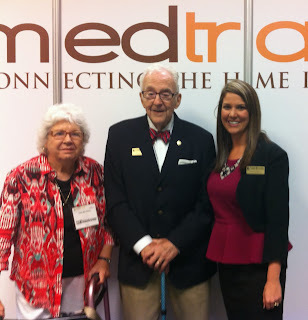 My wife, Thelma, and Christina Brown, my blog partner & the social media director of Medtrade. I always try to arrive at the Medtrade Exhibitions one day early. The show officially opens tomorrow, October 8, at 9:00 AM, when Kevin Gaffney and his team slice the red drape and a swarm of dealers and providers pour through the door to the exhibition floor. This opening experience has always been one of the moments that I relish. Today, Monday, when I arrived at the Convention Center, there was a certain calm, which I still found very reassuring. More than 350 dealers came to participate in a day filled with additional special training classes. When I go into the empty exhibition area and see the crates and boxes arriving from all over the country, I am filled with delight! The hammering, displaying, and activity at each of the locations converts a barren room into the one place that every DME/HME provider awaits. Anything they could possibly need to help their business grow and develop new profits will be waiting for them. All the unfilled space becomes alive and each of the exhibits becomes a special arena where all the action will happen. To date, 2013 has consisted of months of very diligent work by an industry to bring about change regarding how we are reimbursed for our services and supplies. AAHomecare and the state DME associations have spent hours making telephone calls, writing letters, appearing in Washington, D.C. on behalf of all DME/HME providers. Over the next three days, I look forward to seeing an industry continue to roll up its sleeves and work in tandem with their state association and AAHomecare to make the changes we need. HR 1717 must come out of committee; so far 157 Congressmen have signed on. When we all co-operate with diligence this will happen. No matter where your company may be located, whether you provide service to your customers in a small village or a big city, the very same opportunities are there. At Medtrade you will find many seminars on subjects which are appropriate for your company. Schedule to attend those which answer your interests. On the showroom floor find those vendors who will provide additional guidance and show you how to increase volume with them! Our population is aging; there are more senior citizens now than there ever have been! They are a major stepping stone to further growth and consequently better profits. Arrange to speak at “senior” gatherings. Most Houses of Worship sponsor these “clubs.” Make yourself available and they will roll out a welcome carpet to hear what you can offer. A rapidly expanding opportunity is with “obesity.” Many dealers sponsor special classes in their showroom (usually on a Saturday mornings from 10:00am until noon). Invite local speakers such as dietitians, RNs, PTs, or physicians, and invariably there is a full house. But they also, wisely, have all types of bathroom scales and similar items prominently displayed. AAHomecare has always been in the forefront fighting the Competitive Bid legislation and all the other onerous things emanating from CMS and Medicare. Here is an opportunity to make a rather small investment, of only $150.00, that will help your company remain in business despite all the bedlam. Bringing your check will benefit you with a fantastic ROI; your future as a DME provider. Be sure to attend (with your check) AAHomeare’s annual Stand Up for Homecare fundraiser Tuesday, October 8, 5:30-7:00 PM at the Baterbys Art Gallery located at 9101 International Drive (across the street from the Convention Center). I will be there with Thelma, and we look forward saying hello to all our friends. At Medtrade there are many seminars you and your staff be able to attend. You have the privilege of choosing those that will guide you through the coming year. Several attendees bring staff members who plan on each attending different lectures. When back at home, they share all the material they gathered. I spoke with a dealer I know from Missouri. He, his wife, and two employees plan to attend 12 or more seminars each day! 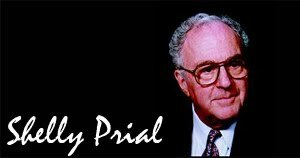 Note from Shelly: His company is one of the most successful! 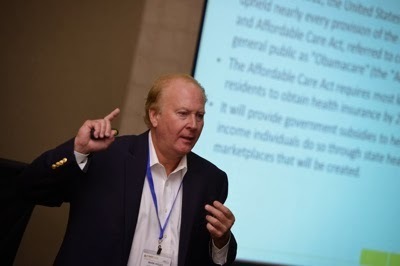 Meet the new team at AAHomecare and CEO Tom Ryan. They want to hear from you. Help them increase their membership. If you are not a dues paying member, please join AAHomecare now. Get on board to stay in business and continue to flourish. As their membership expands, so will the services they perform. It’s not all work at Medtrade. You are invited to participate in the HME Christian Fellowship's “Purposeful Prayer Breakfast” Wednesday, October 9th, 6:30 AM to 8:00 AM, room W311E. 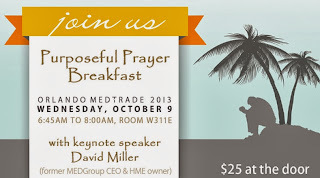 David Miller, an old friend, is doing this for the third year at Medtrade. This is another look at all the wonderful opportunities waiting for you in Orlando at Medtrade.